Finally, the weather is cooling off and I'll post more cooking recipes.After, all, the title of the blog is Baking and Cooking. It has been a very, hot, summer in the Chicago area. When it's so hot I only want cold foods, salads, lots of fruit and veggies, ice cream, yogurt .My husband on the other hand wants pasta, chili, and Coq Au Vin, all heavy meals.We had to comprise. Now, I can post one of favorite meals, which is versatile and easy, besides being very flavorful and delicious.! I got this recipe from my dear friend, Pam, who passed away from a brain tumor in 2003. She had two girls, who are married and have families of their own, and I stay in touch with them. Every time I make this recipe I say "Thank You, Pam". I hope that you enjoy this recipe as much as we do. Ingredients You can vary this recipe, depending on how much pork tenderloin you use, and adjust accordingly. 6. 1-2 tsp Herbs De Provence- This wasn't in the original recipe-we added it. 1. Slice pork in 1/2" medallions. Dredge in flour seasoned with pepper and a pinch of salt, more if you like it. 2. Brown medallions in olive oil, until lightly browned. Remove from pan and cover with foil to keep warm. 3. Saute sliced onions and garlic in olive oil until onions are soft. 4. 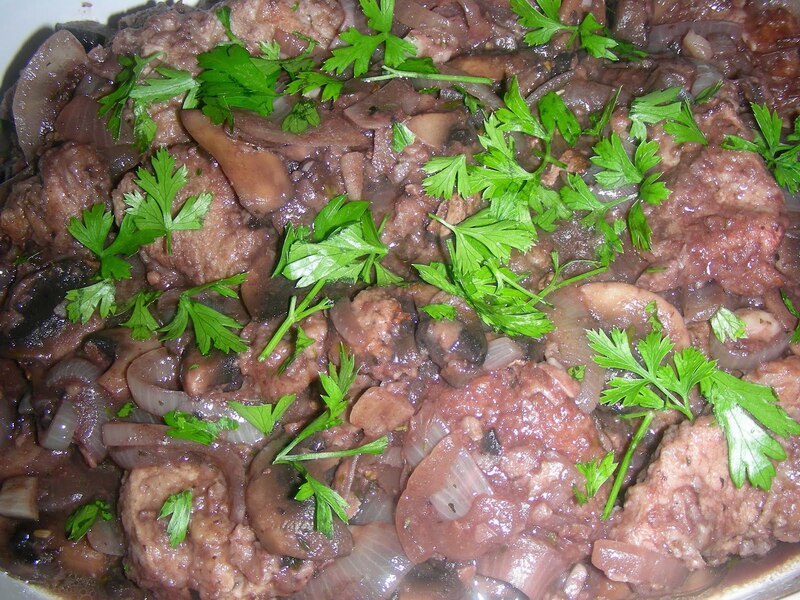 Add sliced mushrooms to onions and cook, until mushrooms are browned. 5.Return the medallions to onions and mushrooms in the pan. Stir in the Herbs De Provence and red wine, cover until the medallions are cooked through, and the sauce is thickened. 6. Serve over noodles, pasta or rice. Smell, Taste, and Enjoy the flavors of this dish! Aww,, Becky! That is so sweet! What a cool way to honor your friend - We were at 60 degrees today! Can you believe it, the heat went on. I feel the same way about making heartier dishes - May you have a blessed weekend! Thank you for the kind words. It was only in the low 60's here. Bring on the soup! Have a wonderful weekend, Megan.